Addgene: Optical functionalization of human Class A orphan G-protein-coupled receptors. G-protein-coupled receptors (GPCRs) comprise the largest human membrane receptor family, relay environmental stimuli to essential changes in cell behavior and represent prime drug targets. 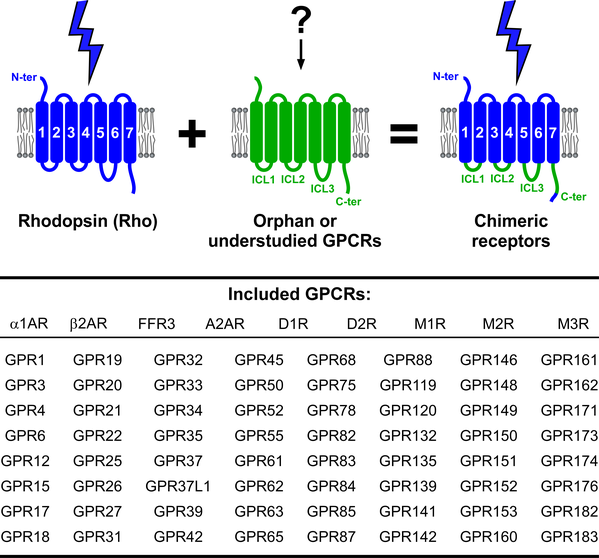 This collection of GPCR expression plasmids for optogenetic experiments consists of >60 chimeric receptors that contain the signaling domains of human orphan and understudied GPCRs functionally linked to the light-sensing GPCR rhodopsin. The replacement of ligand-binding sites with rhodopsin permits activating cellular signaling pathways using light in the absence of the (unknown) chemical ligands. The following human receptor genes are included in the collection: GPR1, GPR3, GPR4, GPR6, GPR12, GPR15, GPR17, GPR18, GPR19, GPR20, GPR21, GPR22, GPR25, GPR26, GPR27, GPR31, GPR32, GPR33, GPR34, GPR35, GPR37, GPR37L1, GPR39, GPR42, GPR45, GPR50, GPR52, GPR55, GPR61, GPR62, GPR63, GPR65, GPR68, GPR75, GPR78, GPR82, GPR83, GPR84, GPR85, GPR87, GPR88, GPR119, GPR120, GPR132, GPR135, GPR139, GPR141, GPR142, GPR146, GPR148, GPR149, GPR150, GPR151, GPR152, GPR153, GPR160, GPR161, GPR162, GPR171, GPR173, GPR174, GPR176, GPR182 and GPR183. Additionally, this plasmid collection contains chimeric control receptors that are light-activated variants of nine prototypical GPCRs and were generated using the same methodology: Adrenergic receptors beta2-AR and alpha1-AR, dopamine receptors D1R and D2R, muscarinic acetylcholine receptors M1R, M2R and M3R, adenosine receptor A2A and free fatty acid receptor FFR3. Collectively, these plasmids provide access to an optically controlled protein library for exploring the physiology and therapeutic potential of GPCRs. Visit the Janovjak Lab website for additional useful information.